In 1971, a book called Silent Messages was published. In this book the author, Albert Mehrabian, concluded that people based a salesperson’s credibility on factors other than the words the salesperson said. The argument that was made was that 55% of a salesperson’s body language and 38% of the tone of the salesperson’s voice determined whether the salesperson was credible. Only 7% was assigned to actual words that were said. Think about that. The argument is that 93% of your communication is non-verbal. As a professional procurement person, I’m not sure I agree it’s that high, but in my experience, it’s definitely greater than 50%! So what does this mean for you as a negotiation professional? It means that mastering your body language and non-verbals is a discipline that cannot be understated. In my experience there are 7 body language (which according to our friend Albert, represents 55% of communication) skills that you MUST pay attention to and that you MUST work on to improve your negotiations. This post is the first of 7 that will focus on the key body language skills you need to excel at negotiations. There’s only one way to shake hands right?!? ​There are lots of different ways to shake hands. But there’s really only one PERFECT way to shake hands. The origin of the handshake is a bit murky, but it was originally thought to show the person you were shaking hands with that you were not holding any weapons and as a show of good faith when making a promise. ​The PERFECT handshake in North America is firm. Not too strong, but firm, with about 2-3 steady pumps of the right hand while looking your contact in the eyes. I HATE SOFT HANDSHAKES. SOFT HANDSHAKES ARE FOR THE WEAK. If you’re a salesperson and you greet me with a soft handshake (or “the wet fish”), you will NOT get the sale. I’ve been known to call people out on soft handshakes and will likely make you do the handshake over if it’s soft. And even if you do it right the second time you still won’t get the sale. You blew it. 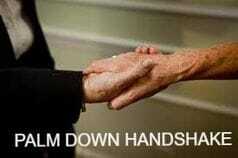 Soft and limp handshakes make me angry. Really angry. I’m getting angry just thinking about them. (shudder). What does your handshake say about you as a salesperson? A handshake tells me a lot about you. It tells me whether you are weak or strong,trustworthy or untrustworthy, friendly or not friendly, dominant or neutral. If you give me a firm handshake with 2-3 steady pumps and look me in the eyes, it tells me you’re confident, you have strength, and you’re credible. DO NOT FORCE THE PALM UP. Some people use the handshake as the first power move in a negotiation. 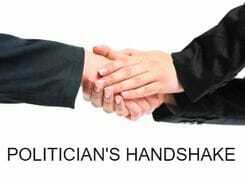 If you come into a handshake palm down and force my palm up, it tells me that you seek dominance and power over the negotiation and the interaction. You are looking for submission. Once you’ve got your firm opening handshake down you can start to get more comfortable with a bit of variety. Now I don’t mean variety in the sense that you should have a complex series of moves like someone from a secret society. What I mean by variety is solely determined by how you want to be perceived. For example, if you want to be perceived as friendly or you’re meeting with a well known acquaintance, you could shake with both hands (the politician’s handshake). You could also try the friendly shoulder, which signals that you are trustworthy and honest (I like this one). But be weary of deviating from the ‘PERFECT’ standard firm neutral handshake that we spoke about earlier. Because if you don’t know how to deliver the different variations, you could end up blowing the meeting. A good handshake is critical to communicating confidence, strength, trust, and friendship. Apparently JFK commissioned an entire study once to determine if there was a ‘perfect way’ to shake someone’s hand. ​If credibility in communication is greater than 50% reliant on non-verbals (and in my experience, it is), then getting good at non-verbals only makes sense. A good handshake is critical in negotiation and is the number 1 body language skill you need to master.